Roundtop Mountain Resort has been a mainstay in Central Pennsylvania for over 50 years. The reason for their continued success? Turning their traditionally winter-focused ski resort into an all-year-round experience for families. When most think of Roundtop Mountain Resort, skiing down the slopes probably comes to mind. Don&apos;t be mistaken, Roundtop certainly offers great options for skiing and snowboarding, but they want you to know that&apos;s not all they offer. 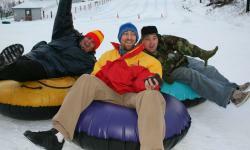 For those who don&apos;t ski or snowboard, snow tubing tickets at Roundtop are available all day. This fun activity will still give you and the family some outdoor time without the need for a ski pass. However, if you&apos;ve never been skiing or snowboarding you shouldn&apos;t feel intimidated. Roundtop is a great place to learn and offers lessons for all skill levels. The slopes range from easy to extremely difficult and include a terrain park and a vertical drop of 600&apos; with a top elevation of 1,355&apos;. Warm up with a trip to the lodge and Fireside Pub & Grill. When the snow starts to melt, Roundtop doesn&apos;t slow down. They ramp up their spring and summer activities and mountain adventures. The warmer weather brings an adventure park, zip line canopy tour, paintball, day and residential camps for kids, and facilitated team-building at the ropes course. 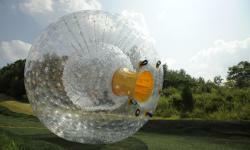 Mountain Adventures, open from Memorial Day to Labor Day, includes the OGO ball (Roundtop is one of only three locations in the United States where you can experience rolling down a hill inside this 11-foot inflatable ball), interconnected climbing features, a water slide, and the longest ziplines on Roundtop property. The Vertical Trek zip line canopy tour features 10 of Roundtop&apos;s zip lines, a Tarzan swing, bridges, cargo nets, and a boulder field. Adventure Camps are Roundtop&apos;s exciting summer camps for children that range from day camps to residential camps. Kids get to enjoy the outdoors while remaining physically active and forming lasting friendships. Last, but not least, facilitated team-building at the ropes course is perfect for any group seeking to understand both inter and intra-personal communication better. 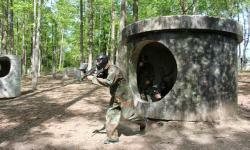 Throughout the year, Roundtop also features paintball. Groups ranging from children&apos;s birthday parties to bachelor parties can take advantage of this exhilarating good time. The really great thing about Roundtop is that all the experiences you can have you are participating and actively engage each participant. Nothing at Roundtop is passive, allowing you and the whole family to get outside and enjoy the beauty and adventure only the outdoors can offer. Lutricia Eberly, Roundtop&apos;s Director of Sales, even added: "The scenic drive to Roundtop through the rolling countryside can be a vacation all in itself."